Like all good tiyulim to Massada, this one began in the middle of the night. 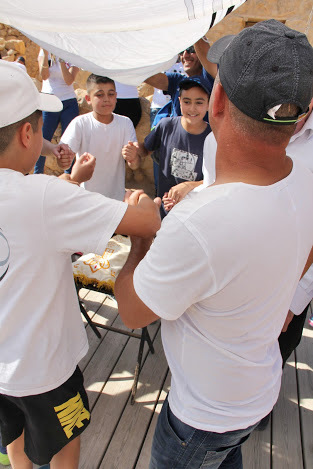 More than 50 sixth graders from the Begin Elementary School in Bet Shemesh arrived at their school at 2:00 a.m. on a weekday in mid-May. Each child was accompanied by a parent. The tiyul was arranged by the local OU Israel Youth Center. 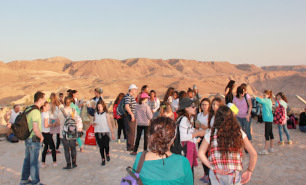 This was a special Bar and Bat mitzvah trip that is part of the Gesharim program which is supported by the Jewish Agency for Israel and is run in the school by OU Israel. “The sixth graders are learning about Massada all year. That includes heroism, Jewish values and history,” says Rikki Toviana, who accompanied her daughter, Maya, on the tiyul to Massada. The reason groups climb Massada so early is because of the heat and also to see the sunrise over the Dead Sea. “We started the climb before 5:00 a.m. when it was still dark,” says Chaim Pelzner, OU Israel Director of Programming. “The kids had to make an effort, so there was a sense of accomplishment when they reached the top. We explained that one of the messages of Massada is that you have to make an effort in order to succeed,” he says. 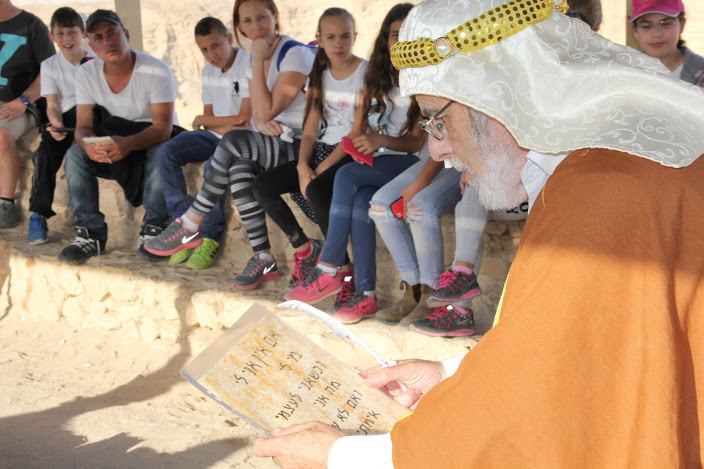 “We planned this program to help the kids connect to the history of the Jewish people,” says Racheli Ninio, Education Director, OU Israel Youth Centers. “We wanted this tiyul to be significant,” Ninio says. The plan included four information stops on top of Massada. Each had a different activity. “The first stop told the prophecy of the dry bones coming to life,” she says. It was staffed by sherut leumi (national service) volunteers who also work in the school weekly during the year. Each child received an album and they learned how to write their names in ancient Hebrew. Next, Hillel HaZaken (the elder) explained the meaning of the text אם אין אני לי, מי לי. Hillel was played by Menachem Persoff, Associate Director of Development, OU Israel. “He explained that the verses talk about what individuals have to do to improve their lives,” Toviana says. “He also talked about becoming better people. And then the kids gave their own interpretations,” she says. Another information stop was at a cistern where a tour guide discussed how important water was on Massada. The children were able to enter the cistern. The final station overlooked the path they climbed up in the dark. Two of the sherut leumi volunteers were in costume here as well. One was dressed up as Elazar ben Yair, the leader of the community on top of Massada. Another volunteer was dressed as a member of the community. “They had a very interesting discussion and eventually asked the kids what they think they would do in a situation like this. The message was that they’re now at an age where they can start making decisions for themselves,” Toviana says. “When we designed the stations, it was important they weren’t just informative,” Ninio says. “After all, these kids know how to search for “Massada” on Google and get the whole story in no time. What we wanted to do is present the story through experiences on the site which would make it more impressive. We wanted to give them the feeling of what really happened on Massada,” she says. The last stop was the Bar and Bat Mitzvah celebration that took place in Herod’s Palace at the northern end of the mountain. “The kids put on a performance and there was singing and dancing,” Toviana says. “There was a canopy made out of several talitot for the children and the parents. We read from the Tanach (Bible). It was very moving,” she says. Several hours after they climbed up to Massada, once the singing and dancing were finished and everyone received a Bar or Bat Mitzvah Certificate, the students from the Menachem Begin Elementary School rode the cable car down to the Visitors’ Center where they ate and then boarded the buses to return to Bet Shemesh.